Morton’s neuroma is a thickening of the sensory nerve of the toes. This nerve runs between the metatarsus and the toes. 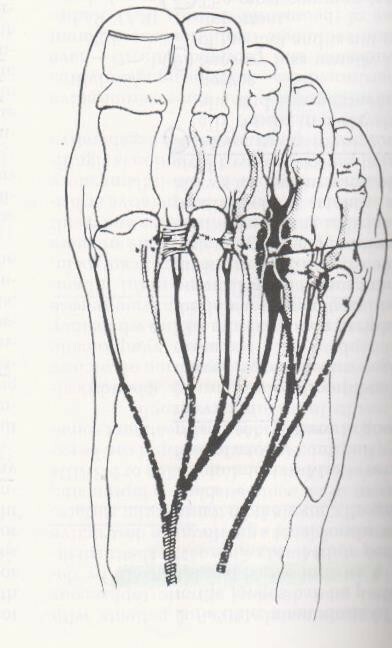 The Morton’s neuroma is usually located in the nerve between the third and fourth toe (counted from the big toe). The swelling and thickening of the nerve, which lead to a neuroma, are the result of compression and irritation of the nerve. It is not entirely clear how this nerve thickening occurs. It is likely caused by the nerve being repeatedly damaged bit by bit, such as being stuck between the heads of the metatarsus. This may occur as a result of wearing shoes that are too narrow. A sagging foot may also result in additional pressure on the nerves. It is much more common in women than in men. In the first instance the symptoms will be mild and only occur when wearing narrow shoes. Later on the complaints may be permanent, even when not wearing shoes. If you are suffering from one of these symptoms it is best to contact your GP or orthopaedic surgeon. An attempt will be made to reproduce the symptoms during a clinical examination. Technical tests such as an ultrasound and NMR may be used to confirm the diagnosis. Shoe inserts: A therapy sole can be produced to relieve pressure on the Morton’s neuroma. As a result the complaints are alleviated and if they are not chronic a therapy sole can help recovery. Recovery of the Morton’s neuroma is a lengthy process. Experience teaches us that a neuroma treated with the right therapy sole can recover at a rate of one millimetre a year. Neuromas that cause complaints are usually five millimetres or thicker in diameter. A complete recovery lasts at least a couple of years. A thick neuroma requires a thick therapy sole, because a deep hole must be made in the therapy sole to relieve the pressure on the neuroma. You must take this into account in your choice of footwear; to achieve good results you need a shoe that is wide enough, has a removable sole, and not a high heel. Footwear advice: Since the neuroma is located between the heads of the metatarsus, it ‘pops out’ when the foot is squeezed together. The neuroma is on the bottom of your foot and you step on it whenever you walk. Therefore, the shoe must be sufficiently wide for the ball of the foot. You could purchase ‘natural shape’ shoes with removable soles, so that there is adequate space for your therapy sole. It is especially important that you obtain advice from a specialist shoe shop. Anti-inflammatory medication: this serves to reduce the pain and combat localised inflammation. It can only be taken temporarily. Infiltration: In some cases an injection of corticosteroids (adrenal cortex hormone) may reduce the irritation in the nerve. Corticosteroids have an anti-inflammatory effect. These injections may be administered a maximum of twice or three times. The disadvantage of these injections is that the cortisone can make the subcutaneous adipose tissue extremely thin. The injection is effective at reducing the complaints but often only provides temporary relief. Surgery is considered if non-surgical treatments have failed. Removing the neuroma: Sometimes it is not possible to perform a nerve-saving procedure. One example is when the nerve cannot be properly inserted between the metatarsus. This can be effectively assessed by an ultrasound of the foot. To remove the neuroma an incision is made on the top or bottom of the foot where the Morton’s neuroma is located, in between two toes. The Morton’s neuroma is removed along with a healthy section of the nerve branches, which prevents the thickening recurring or doing so quickly. The incision is closed with dissolvable stitches. Freeing the neuroma: A small incision is made on the top of the foot where the Morton’s neuroma is located, in between two toes. Via the small incision the band under which the neuroma is located, is severed, creating more space for the neuroma. In this method the neuroma is left in place. Only the band is removed. Experience has taught us that in this scenario the neuroma has the chance to move upwards when you put weight on your foot. This means the painful ‘pop’ experienced with a Morton’s neuroma is no longer felt (see images).